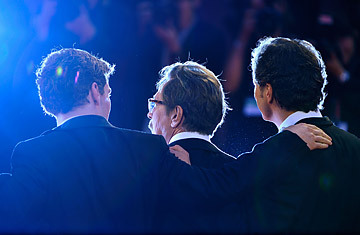 Actors Benedict Cumberbatch, Gary Oldman and Colin Firth attend the Tinker, Tailor, Soldier, Spy premiere at the Palazzo del Cinema during the 68th Venice Film Festival on September 5, 2011 in Venice, Italy. Bucking the trend for macho action movies in Hong Kong's glory days, Ann Hui directed memorably wrenching social dramas, including the 1995 Summer Snow, with middle-aged Josephine Siao caring for her Alzheimer's-afflicted father-in-law (Roy Chiao). A Simple Life was inspired by the recollections of Summer Snow's producer, Roger Lee, about the woman who for generations served him and his family. The film's Roger (Detective Dee's Andy Lau) takes a while to recognize the warmth and selflessness of his amah Ah Tao (Deanie Yip); but as her health grows more fragile and she relocates to a rest home, he becomes his caregiver's prime caretaker and companion. "Handsome feller," she says on one walk with Roger. "Gorgeous gal," he replies. Ah Tao is portrayed with a poignant delicacy by Yip, a Canto-pop singer and pert supporting actress in the 1980s, who has matured to pay superb justice to a gracious lady of quiet heroism. The Venice jury would honor itself as much as Yip by giving her the Festival's Best Actress award in this film of grand and acute emotions. M.C. A little boy stares at a dying rabbit, takes a stone and smashes the critter. The boy sits in a theater with his older, mute sister, watching a 3-D horror movie when a stuffed toy rabbit rotates from the screen towards him; enthralled by the magic of 3-D, he reaches for the stuffed rabbit, pulls it out of the film, and takes it home with him. A man-size rabbit kidnaps the boy and takes him to a fairground more sinister than the eerie ghost park in Hayao Miyazaki's Spirited Away. Any or all of these strange events could have happened. Any or all might be someone's fantasy. Hiroshi Shimizu  who directed that exercise in haunted-house suspense, Ju-On / The Grudge, in both its original Japanese version and the English remake  has turned an Alice in Wonderland premise into a weird-land of rabbit holes and cinematic sleight-of-hand. In this fantasy of wonders and terrors, creepy impulses may propel the boy, his sister, or their father toward madness. One of them nurses a very deep grudge indeed. Cinematographer Christopher Doyle, whose odysseys have led him to fruitful collaborations with Wong Kar-wai, Gus van Sant, and Phillip Noyce, lends his swirling artistry to the 3-D scenes especially in the fairground scenes when day turns to night and rain drops become bubbles; and Shimizu weaves a mood both chilling and invigorating. Rabbit Horror isn't in Toronto, but the Texas company Well Go USA has bought the film for U.S. distribution and renamed it Tormented. Under either title, this is a succulent rabbit stew. M.C.